Community, Enterprise, and OC4: What’s the Difference? Attend our 4/23 webinar, "Turning the (Data) Tables: Applying Reference Ranges and AE Codes in OC4"
Electronic Data Capture (EDC) is admittedly a fairly generic sounding term, but in the clinical trials field it actually means something fairly specific: using systems to collect clinical trial data in electronic form as opposed to paper form. At OpenClinica, we are immersed in EDC all day, every day. However it’s important to recognize that many participants in the field of clinical trials are still just getting their feet wet with EDC. So, here’s a primer on the fundamentals of EDC. What is Electronic Data Capture (EDC)? Modern electronic data capture software is typically web-based and utilizes a thin client. Web-based means that the software runs entirely on a Web server (think Google.com), and thin client means that the only tool you need is an ordinary web browser (without any cumbersome plug-ins) connected to the internet in order to access and utilize the EDC software (again, think Google.com). Clinical trial data may be captured electronically at its source (called e-source), or in paper form and later transcribed into the EDC system. Sites – A site refers to the entity that coordinates and collects data from the clinical trial patients, or subjects; usually a hospital or clinic. Nurses or other designated study “coordinators” employed by the site will typically be tasked with entering data into the study’s EDC system. The site’s Investigator—the physician in charge of the patient’s care and patient’s data–is responsible for reviewing and electronically signing the data. Sponsor – The sponsor of a clinical trial is the organization that “owns” the trial. Biopharma, device, and other life sciences companies must sponsor clinical trials in order to get their medical innovations approved by regulatory authorities (like the FDA) before they can go to market with their product. Sponsors may employ a variety of people who use the EDC system in various roles. Monitors working on behalf of the sponsor may visit the client sites to review data source documents and verify the accuracy of corresponding data in the EDC system (with EDC software this “visit” is often virtual). Biostatisticians help plan for and analyze data collected. Typically heavy users of EDC software, data managers have the responsibility is to ensure the trial data is clean and usable. Among other tasks, they may submit requests for information (called “queries”) to the sites to clarify and resolve data issues. CRO – A CRO, or contract research organization, is an entity that contracts with Sponsors to facilitate the planning and conduct of a clinical trial. In some trials, the CROs may effectively operate the trial on behalf of the sponsor. In other trials, they will take on only some of the key roles (data management, monitoring, analysis). In this regard, CROs may have many of the same types of EDC system users as sponsors. In academia, CROs are often called AROs (Academic Research Organizations), Clinical Trials Units, or Data Coordinating Centers. Their coordinating and management functions are much the same as their commercial counterparts. In addition to the above types of EDC users, study patients may also contribute data to the EDC system, either directly through a specialized role in the software, or via a separate device and/or application that transmits data to the EDC system. 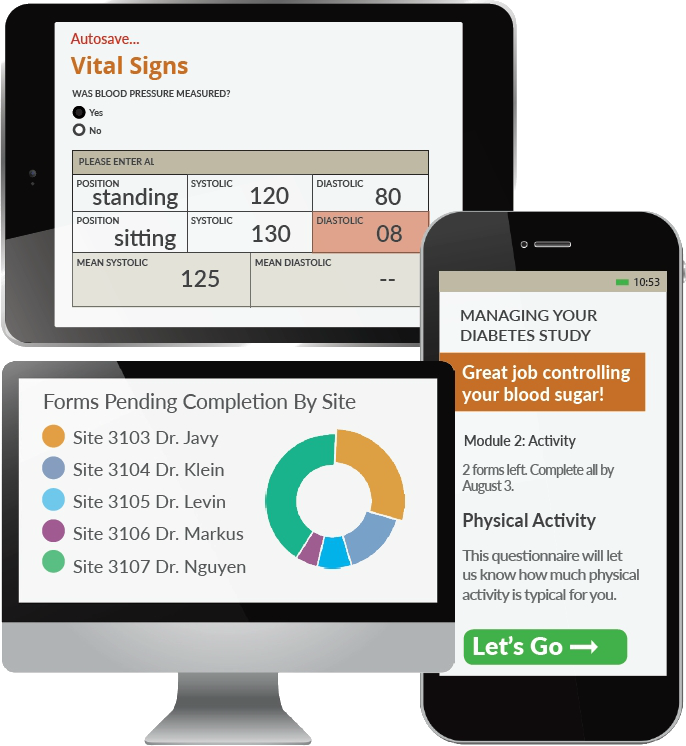 The practice of patients entering data is called ePRO (electronic patient reported outcomes). Cleaner Data – EDC software is particularly good at enforcing certain aspects of data quality. Edit checks programmed into the software can make sure data meets certain required formats, ranges, etc. before the data is accepted into the trial database. More Efficient Processes – EDC software can help guide the site through the series of study events, requesting only the data needed for the particular patient’s circumstance at a particular time. It faculties the process of clarifying data discrepancies with tools for identifying and resolving data issues with sites, and can help reduce the number of in-person site visits required during a trial. Faster Access to Data – Web-based EDC systems can provide near real-time access to data in a clinical trial. This insight enables faster decision making, and can support adaptive trial designs. Each of the above reasons for using EDC addresses issues of efficiency and productivity, and can therefore also reduce the cost of clinical trials. In the 1990s electronic data capture was referred to “remote data capture” (RDC). Compared to today’s technologies, these systems were quite archaic, often built an a client-server architecture involving a thick that sometimes took the form of a specialized device, as opposed to an every-day PC. These systems were essentially data “silos” that had no easily ability to interchange their data with other systems. Today, the integration of EDC software with other types of software in the eClinical spectrum (randomization, supply management, adverse event reporting, coding, submissions, etc.) systems is increasingly feasible and beneficial. The ability to quickly and reliably import electronic data from other sources (such as lab reports, imaging data sources, and electronic health records) is also becoming commonplace. The rise of open source EDC software and independent standards for characterizing and sharing data (like CDISC) are key enablers towards accelerating the productivity and decreasing the cost and burden associated with clinical trials. See what's new in the world of data capture. Download our open source software. You’ll need to install on your own server, and you won’t have our validation documents. But our Community Edition gives you the breadth and flexibility of features you need to get started. Let's talk! Tell us your challenges, and we'll show you more of the features that can solve them. What are your greatest needs in a data management solution? To get free tools, news, and resources by email, select one or more of the topics below.